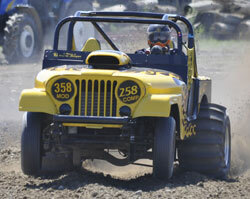 2012 marked the 40th Anniversary of the Las Vegas Jeep Club Jamboree. This was a milestone event for the club as it has certainly lasted the test of time. The Dumont Dunes, a couple hour drive west of Las Vegas, was the site for this Anniversary event. Many long time racers as well as a few new entrants showed up for competition at this unique event. Saturday featured a Hill Climb event with Sunday being the 300’ Sand Drags. It certainly was amazing to see a flat piece of sand built and groomed into a sand drag track in a matter of hours. Read on for the full coverage of this event. 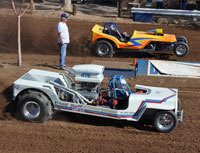 The 2012 sand drag racing season kicked off with a huge show at Dome Valley Raceway in Wellton, AZ. A Dome Valley Raceway record of over 200 entries turned out for the season opening Top Fuel Shootout event. This race also served as the first race for the 2012 NSRA point series, so racers are starting their quest for the season championships. Read on for the Race Recap. The 2012 NSRA Quality Aircraft Care Sand Times Drag Racing Series kicked off the season with a great event at Dome Valley Raceway in February. Despite the cancellation of Race 2 at Dome Valley, the series will go on as scheduled with a total of 8 events in 2012. Additions to the schedule will be made for the Fall half of the season, and we will pass along the details as soon as they are finalized. The series will continue on with the next event being at the SCSDA April Fuels event upcoming on March 30-April 1. Click the link below to view the current points & info regarding the 2012 NSRA point series. Wow, what an amazing start to the 2012 race season. The 3rd Annual Top Fuel Shootout at Dome Valley Raceway was just plain well attended, both on the racer & spectator side of the fence. Couple this with the great attendance seen at the 2011 SCSDA Season Finale, and those events are two great signs for the sport with all that is happening in the World today. I have to say that the on-track performance at the Dome race was some of the best I have seen in a while, both ET wise & in close racing. Scott Whipple’s amazing performance in Top Fuel was truly something special, with “Famous Amos” turning the screws to FIVE consecutive 2.2 second passes on the weekend. The Pro Truck class was a huge hit with 17 entries making the first round call. With Pro Truck Nationals putting up some extra cash, it was great to see the level of competition in Pro Truck’s first appearance on the west coast. It’s a good thing to see some of the cool aspects of the sport stretch across the country. The 3rd Annual Top Fuel Shootout at Dome Valley Raceway was certainly the biggest to date with a massive racer & spectator turnout. The crowd saw great side by side racing to start off the 2012 season from Top Fuel all the way down through the Junior classes. Let’s take a look at some of the noteworthy stories through photos from NSDN Editor, Tom Bray. Dome Valley Raceway has announced that the upcoming March Madness event set of March 3-4 has been cancelled. DVRW is going to be reviewing all aspects of the track's race program for future improvement. Brenden Root, who was involved in an incident while standing track side, is now at home and is recovering very well. Terri Blair is also doing well after the incident with her Top Fuel car during qualifying on Friday. Thanks again to all of the racers & spectators for their support, stay tuned for further updates regarding Dome Valley Raceway.